Chief of Army Staff Lt.Gen Tukur Buratai yesterday tasked combat support arms troops deployed for the counter-insurgency operations to remain focused and be proactive at all times so as to ensure final defeat of the Boko Haram insurgents. According to Lt. Gen. Buratai, though Boko Haram sect have been technically defeated, there is much to be done to sustain the tempo. 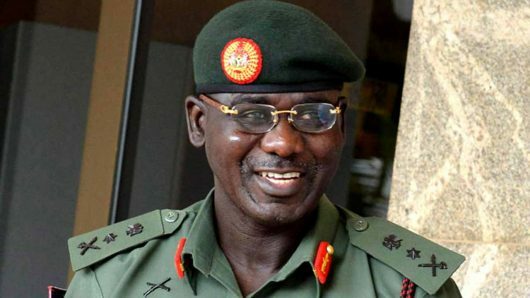 Buratai made the observation while speaking at the opening ceremony of the five-day Combat Support Arms Training week, (COSAT) holding in Maiduguri. Represented by Commandant, Training and Doctrine, (TRADOC), Major Gen. Abubakar Salihu, the army chief re-emphasized the need for synergy and proactive measures to ensure final defeat of the insurgents. “Iam glad to state that significant progress have been achieved and successes recorded in the operations against Boko Haram such as Lafiya Dole and Last Hold, thereby denying them and other criminals freedom of action. The insurgents have been techically defeated, however there is more to be done, we must remain focused and be proactive at all times”. “As combat support arms, you have a major role to play in the final defeat.This calls for more efforts and synergy for all to achieve the desired goal of ensuring enduring peace that will enhance development in the country” he told the participants of the training. He said the COSAT is an annuql event organised on a rotational basis among the combat support arms of thr Nigerian Army to brainstorm and re-strategise towards combating contemporary security challenges. “It is gratifying to note that the outcome of the previous trainings have been instrumental to major policies of the Nigerian Army”. “This year’s training is coming at a time when the nation with the military is at the threshold of completely routing out the remnants of Boko Haram terrorists and also when the fight to eliminate other criminal elementa are in top gear”, Buratai declared. Borno state Governor Kashim Shettima who declared the event open, applauded the military for sacrifices and patriotism towards ending the insurgency. Governor Shettima, who was represented by his Deputy, Usman Mamman Durkwa pledged to continue supporting the Nigerian Army to ensure total restoration of peace and normalcy through ending the insurgency. Buratal also warned all criminal elements in the country to immediately surrender all illegallt aquired weapons in their possession, saying anyone found carrying illegal weapons will be decisively dealt with.